I love lilacs. They're one of my favorite flowers. We never had them as kids because my mother is super allergic to them, but my new place has a tiny bush outside, and I steal the blooms for scent and prettiness as much as for food. Yup, lilacs are edible.Lilac is a member of the olive family. But they aren't very olivy in the way we normally eat them. Instead, they have a sweet and bitter lemony taste. They're also awesome in lemon water and vodka drinks. 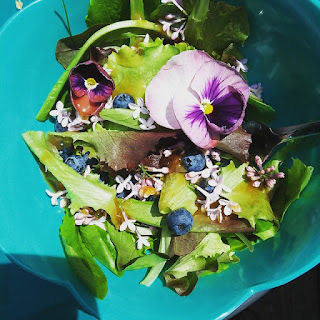 So, when I smelled the heady scent of first blooms on the air this morning, in the warm sunshine of an early summer in the Bing, I knew I had to make a salad. But first I needed to hit the farmer's market to see what was out that might work. Lo and behold, Shared Roots Farm was selling a baby mix and I snagged small bags of each of their greens and made my way home.